Inevitably, an educational program will be based upon some view of man’s nature and end. The understanding of human nature implicit in the vast majority of university curricula today is secular humanism, a world-view in which man is ultimately no more than an animal, a by-product of blind evolution, having no ends or values but those which he determines for himself. Hence contemporary college and university curricula are at odds with the view of man that formed Western civilization itself—the Catholic view that man is uniquely endowed with a rational and immortal soul, that he is created in the image and likeness of God, that his life is subject to objective moral norms, and that he is called to an end that transcends this life. As today’s parents and students have been learning to their sorrow, educational institutions at odds with Western civilization cannot hand it on; they can only attack it with ideological violence or abandon it altogether, as they pursue lesser goals, pragmatic and utilitarian. 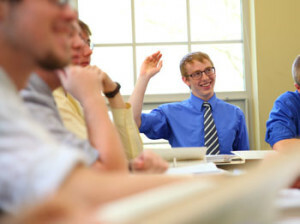 Following Newman’s lead, Christendom College does not limit its aims to the training of students for particular careers. It seeks, rather, to give them the arts that are fundamental to the life of reason itself. These “liberal arts” are universal in application, both inside and outside a chosen career. The liberal arts student learns to think logically and to express himself clearly—skills absolutely necessary for one who wishes to influence his society for the better. He immerses himself in the great ideas and works of the Western tradition in order to appropriate that tradition and make his own contribution to it. He studies the past actions of mankind in history and the morality of individual and corporate deeds in order more prudently to determine his own actions, assess his society, and influence the course of events. For this very reason, no graduates are more eagerly sought in law, business, journalism, politics, teaching or other professions than the graduates of traditional liberal arts colleges such as Christendom.